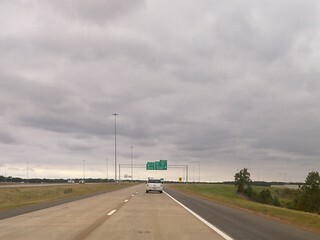 Closing out this batch with another view from my day 1 trip down 269, as I was coming back to the 55/69/269 interchange. The road had been open for several hours at least when this photo was taken. Luckily, the light rain from very early in the morning had cleared, but as predicted, that rain also prevented crews from finishing the last little bit of paving on I-55.